When a couple is married, they take wedding vows promising how they will treat each other and live together. When a child is born, no such vows are typically taken. 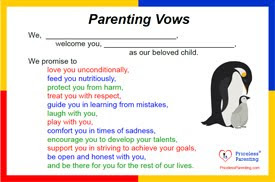 However, if you were to make a vow to your child, what would you say? Below is what I would say. Click the picture if you'd like to print out a copy. What would you vow to your child? and be there for you for the rest of our lives.